I have an older Motorguide Tracker Pro-Series 40 that I'm trying to get the prop off of. Have taken the plastic prop nut off, but cannot get the prop off the shaft. Is there a trick to it I'm missing? I want to see if the props on either of my 2 transom mount TM's will fit it so I can take a spare with me on a little trip I'm taking next month. FWIW, this isn't my video, but this is the TM I have. I would try tapping the prop with a small hammer & block of wood, and pentrating oil. Prop is propbably corroded onto the shaft. have you tried PB blaster? It is a good idea to frequently remove a tm prop to check for line build up. Just in case . It hides under the prop robbing power. Last edited by timsmcm on 26 Sep 2016, 09:17, edited 1 time in total. It is a good idea to frequently take of a tm prop to check for line build up. Just in case . It hides under the prop robbing power. Will now be part of my routine. Thanks. 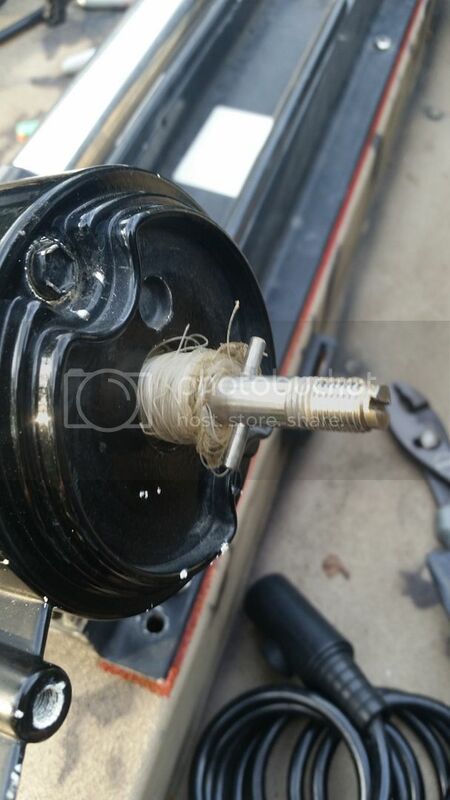 More than robbing power, fishing line can cut through the prop seal and let water get into the motor. Braid is especially bad.